The story of Daniel in the lion's den teaches us about the promises and faithfulness of God, even if we feel like everything has been lost. King Darius was ruler over Babylon and had appointment several men to help him govern and lead. Daniel, the leader of advisors, was a man who believed in God and followed the Lord's commands. The other men did not like Daniel and did not want him in charge so they devised a way to get rid of Daniel. These men knew that Daniel served the God of Israel. They told King Darius to make a new law in which people could worship and pray to only the king and if they worshipped or prayed to other gods, they would be thrown into the den of lion's. The starving lion's would eat and kill the law breaker. 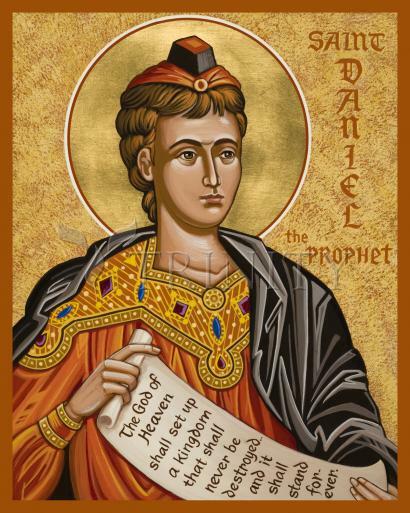 Daniel knew the new law, but committed in his heart to remain steadfast in his prayer and praise to the Lord. Daniel prayed three times a day with his windows open. When the men saw Daniel and brought accusations against him to King Darius, the king was devastated because he favored Daniel. The king knew he could not change the law and Daniel was thrown into the lion's den. His feast day is December 17.